Have you ever enjoyed the sharing of your earphone with any other person? But, what if the one side of the earphone is echoing the verses of song while the other side is playing music? Now, the Splitr the app, for the iPhone, iPad and iPod is developed in such a way where you can enjoy music in one ear while in other ear, you may listen songs. The new app, Splitr, released on April 29, 2013 is such an app that can play a music player that can play two tracks of music from your iPhone’s media library and yet simultaneously. The novel thing is that audio for one song can be listened in one earbud of the earphones whereas on the other bud, you may enjoy the second track. 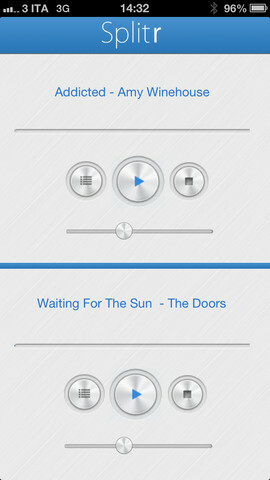 Splitr is developed in such a way to mash-up 2 of your favorite songs/music in an uncomplicated manner. This is not the first such iOS app with such unique feature on music playback via earphones but one such example was Awareness but the Splitr appears to be more useful as compared to Awareness. When we load the Splitr, main screen is displayed, equally divided into two half parts. The top half is designed to control right side of the earphone for music while the lower portion is used for the left bud of earphone. If you want to pick a song for each side of earphone, simply tap the first icon for the half which can take you to music library of your device. The names of the selected songs and and the artists are displayed in the top half. Splitr can also offer separate playback control for each side which include pause, play, stop and a volume slider while the playback continues in the background. The app is available for iPhone, iPod touch and iPad with iOS or later. Newer How the Debt Payoff Planner Helps to Streamline Your Finance?